In addition to the detection of Cryptosporidium and Giardia in submitted samples, we provide potential viability testing by vital dye staining. This procedure lacks the sensitivity and accuracy to determine the viability of the detected cysts and oocysts. Thus, to reliably and accurately asses viability of Cryptosporidium oocysts, we perform a cell culture infectivity assay. We utilize the infectious foci detection method (FDM) on infected HCT-8 Cell monolayers. 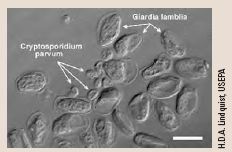 Submitted and lab studies' generated samples are analyzed for infectious C. parvum as per the method described by Slifko et al. (1999), Johnson et al. (2006), and recommendations from American Water Works Association Research Foundation (AWWARF 3021; Detection of Infectious Cryptosporidium in Filtered Drinking Water). We regularly conduct Cryptosporidium and Giardia inactivation studies that assess the disinfection efficacy of a variety of chemical and physical disinfectants. These studies can be conducted at the client's facility should biological containment be available or in our dedicated visiting scientist wet-lab study area. Please contact BCS for information on the assay and to arrange for a price quote. 1. Slifko TR, Huffman DE, Rose JB. A Most-Probable-Number Assay for Enumeration of Infectious Cryptosporidium parvum Oocysts. Applied and Environmental Microbiology. 1999;65(9):3936-3941. 2. Kar S, Gawlowska S, Daugschies A, Bangoura B. Quantitative Comparison of Different Purification and Detection Methods for Cryptosporidium parvum Oocysts. Vetinary Parasitology. 2011;177:366-370. 4. Aboytes, A.; Di Giovanni, G.D.; Abrams, F.A. ; Rheinecker, C.; McElroy, W.; Shaw, N.; & LeChevallier, M.W., 2004. Detection of Infectious Cryptosporidium in Filtered Drinking Water. Jour. AWWA, 90:9:88. 5. Rochelle, P.A., Johnson, A.M., De Leon, R., and Di Giovanni, G.D; 2012. Assessing the risk of infectious Cryptosporidium in drinking water. JOURNAL AWWA | MAY 2012; 104:5. Proceedings of The American Water Works Association Research Foundation (AWWARF 3021; Detection of Infectious Cryptosporidium in Conventionally Treated Drinking Water; http://dx.doi.org/10.5942/jawwa.2012.104.0063).